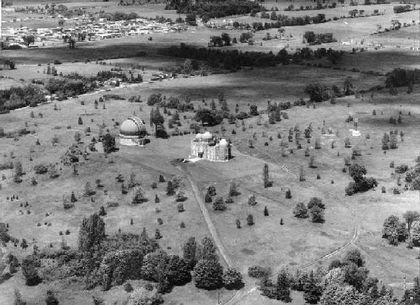 The David Dunlap Observatory opened its doors in 1935 near the small town of Richmond Hill, 25 kilometres north of Toronto, Ontario. The facility was the property of the University of Toronto and was operated by the astronomy department. It was created to conduct astronomical research, to assist in the advanced education of university students, and to stimulate the public’s interest in astronomy. The observatory was mainly the work of Clarence Augustus Chant, a Canadian astronomer and astronomy professor at the University of Toronto. In 1921, while campaigning to establish a large telescope observatory in the Toronto region, Chant managed to get David Dunlap, a lawyer and mining entrepreneur, interested in the project. Unfortunately, Dunlap died in 1924, but his widow, Jessie, took up the cause and worked for the next ten years with Chant to make sure the project succeeded. 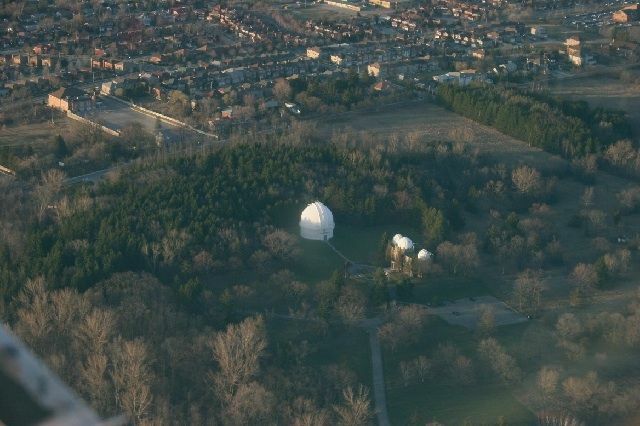 The observatory was inaugurated the same day that Chant celebrated his 70th birthday, received an honorary doctorate from the University of Toronto, and took his retirement. 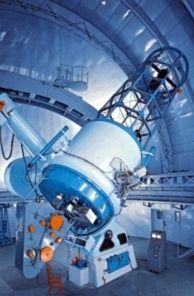 At the time of its inauguration, the observatory housed a 1.88-metre telescope, the second largest in the world after the Mount Wilson telescope in the United States, and Canada thus owned two of the four largest telescopes in the world. The building that houses the administrative offices of the observatory was also inaugurated in 1935. Three small domes covered the roof and a 15-centimetre telescope was immediately installed in one of the domes. Two new 50- and 60-centimetre telescopes arrived later to occupy the other two domes. 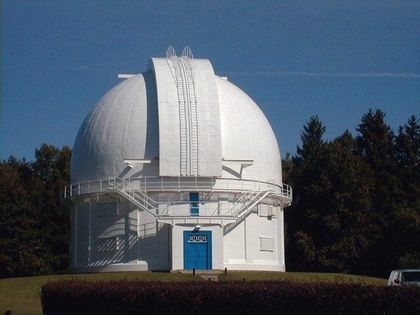 Over the years, more and more radio astronomers were joining the astronomy department at the University of Toronto, and in the 1960’s, the David Dunlap Observatory actively participated in the development of the Algonquin Radio Observatory in Ontario. By the end of the 1960’s, the David Dunlap Observatory, being located near the major urban centre of Toronto, found itself plagued with the problem of light pollution. The observatory responded in 1971 by erecting a 60-centimetre telescope at Las Campanas in Chile. The David Dunlap Observatory thus acquired international status and the skies of the south were available to Canadian astronomers for the first time. A spectacular discovery was made at the David Dunlap Observatory in 1972. Charles Thomas Bolton, one of the observatory’s astronomers, discovered Cygnus X-1, the first black hole ever identified. In 1987, the observatory was responsible for another amazing discovery thanks to its telescope in Las Campanas. Ian Shelton, one of the astronomers from the University of Toronto, was using the Chilean telescope when he observed a supernova (1987 A) in the Greater Magellan could. The discovery made headlines around the world, as it was the first supernova visible to the unaided eye in almost 400 years. Unfortunately, financial problems forced the David Dunlap Observatory to cease operations at Las Campanas in 1997. The National Observatory of Argentina took charge of the telescope and moved it from Chile to Parque El Leoncito in Argentina. The David Dunlap Observatory nonetheless retains one quarter of the observation time at the telescope. 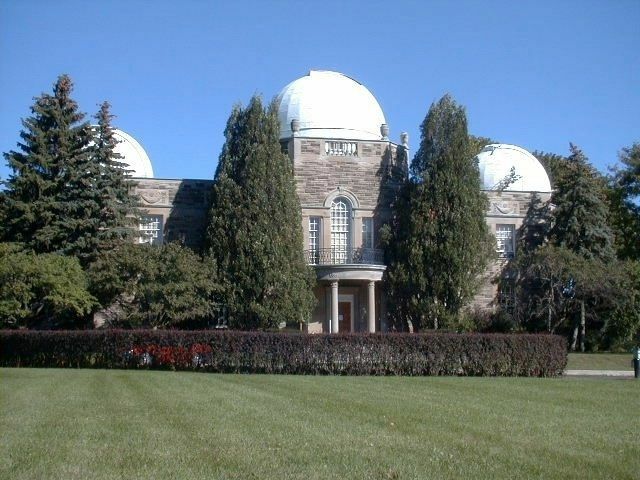 In 2009, University of Toronto sold the David Dunlap Observatory. It is now operated by the Toronto Chapter of the Royal Astronomical Society of Canada. Educational activities and public stargazing events are offered on site.